A local optician is looking to support a charity’s essential work by riding 200 miles in just 2 days in September. 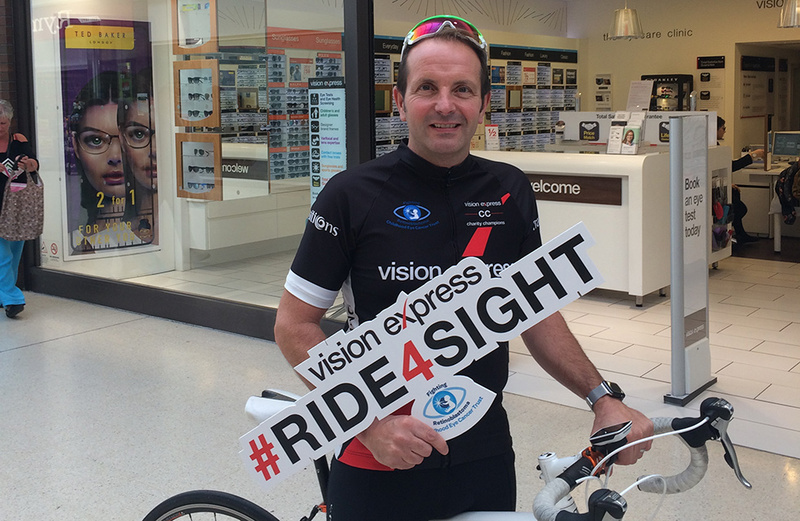 Steven Pickering, the popular optician at Vision Express in The Springs Shopping Centre, is preparing to endure an arduous bike ride all in the name of charity. Riding from Newport, located in south east Wales, all the way to Nottingham in the space of 48 hours, Steven is one of 37 riders looking to raise funds and awareness of the Childhood Eye Cancer Trust. Steven Pickering said: “Back in 2014, I hopped on a bike and managed to ride from London to Nottingham – it was really tough going. This time, the bar has been raised even higher and Newport to Nottingham over 2 days is going to be incredibly difficult. Expecting long, steep hills especially through the first day in Wales, Steven and all other riders from Vision Express are expecting a gruelling challenge. Steven continued: “Fortunately, I have the right surroundings around me to get out on my bike and practice. Most evenings are spent riding home from work to my home in Staffordshire. Usually taking the long way around, my journey can be up to 50 miles. Copyright © THE SPRINGS SHOPPING CENTRE. All Rights Reserved 2015.